Looking like a 20-year-old in your 40s isn’t a fairy tale anymore and you can get the fresh and wrinkle-free appearance once again when using a Vitamin C serum. Able to match women of all ages and skin types, the vitamin C serum brings numerous good things to the table and is, by far, one of the most popular choices out there when it comes to fighting the aging of skin. What are the benefits of the Vitamin C Serum? What does it do for our skin? Protects the skin from sun damage: the Vitamin C serum keeps the damage from the sun’s UVA and UVB away from your skin as it’s antioxidant, strengthening the skin. This doesn’t mean you can give up to your sunscreen, but you can relax about the sun’s damage while using a sunscreen and vitamin C serum altogether. Boosts collagen production: Thanks to the concentrated levels of antioxidant-rich vitamin C, the vitamin C serum sustains the collagen production of skin, filling in the wrinkles and fine lines. Smooths out the skin discoloration: If you’re struggling with skin redness or other skin discoloration, the vitamin C serum is strong enough to even out your skin tone, improving the skin complexion. Minimizes the under-eye circles:Vitamin C serum makes the under-eye circles less visible and gives a vibrant feel to skin. Sustains hydration and moisture: Vitamin C serum is a great ingredient for the dry skin and eliminates dryness and flakiness from skin. Vitamin C is able to help the sunburns heal faster, but it’s also strong enough to reduce inflammation. Puffiness around the eyes on other areas of the skin/face are going to look way better when using a vitamin C serum. You can use the serum not only on face, but also on other areas if you’re trying to speed up the healing of small cuts, acne scars and various blemishes. As it improves your skin’s overall complexion, vitamin C eliminates dullness from skin, giving it a healthier and brighter feel. It rejuvenates the skin and maintains your skin younger and healthier for longer time. 1.Not only the Vitamin C Facial Serum with Hyaluronic Acid, and Brightening Serum by Pure Body Naturals comes for an unbeatable price, but it also manages to actually improve your skin tone, standing out with its impressive quality for the buck you’re paying. The Vitamin C serum keeps your skin healthy and boosts the collagen growth in skin, lessening the appearance of wrinkles and fine lines. Formulated on Vitamin C (20%), the serum also contains Hyaluronic acid, jojoba oil and vitamin E- each of them with well-known benefits to skin. On the list of ingredients, we’re also noticing aloe Vera, plant based hyaluronic acid, witch hazel, arginine, ferulic acid, Gotu Kola extract, geranium extract, dandelion extract and horsetail extract. You’re not going to see any chemicals nor synthetics within the formula either. The serum is both vegan and cruelty free. The formula is also oil and water based so it has a lightweight consistency. The serum doesn’t leave an oily feel on skin and it’s easy to follow it with your moisturizer. It tightens the skin and shrinks the pores, without drying or flaking it. The velvety finish of the serum leaves a nice soft touch feel to skin. The serum is easy to use and comes with an eye dropper for getting the right pint of it every time. You can use it twice a day. Minimizing the visibility of discoloration and age spots, the serum is a dependable step to include in your daily skin care routine. The price tag may seal the deal for most, but the serum doesn’t disappoint on improving your skin complexion either, so it’s money well spent any given day. 2.Just because you’re going shopping on a tight budget, it doesn’t mean you should go back home empty handed. And just because a serum is low priced, doesn’t mean it’s not powerful to try. 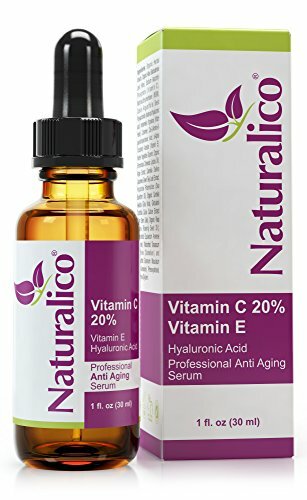 The Naturalico Anti-Aging Organic 20% Vitamin C Serum for Face with Hyaluronic Acid sure proves wrong to anyone considering that cheap products aren’t worth a try and it’s both reliable and gentle on skin. Despite of one may think, the serum is made with high quality ingredients and gives your skin back it radiant youth. It eliminates dullness from skin and fades out discoloration. Stimulating the collagen production, the serum tones and firms the skin, keeping the risk for wrinkle at distance. Made from 98% pure natural ingredients, the serum includes an impressive number of them: vegan hyaluronic acid, organic rosehip oil, plant stem cells, aloe Vera, jojoba oil, algae extract, green tea, sea buckthorn oil, Gotu Kola, dandelion, wild geranium and horsetails. Addressing the existing damage, but also offering antioxidant protection from oxidative damage, the serum boosts collagen and moisturizes the skin. It brightens age spots and makes the skin firmer and younger looking. It works for all skin types and has no alcohol or parabens. It goes under makeup and soaks right into the skin. It has a sweet subtle herbal scent that doesn’t linger for long. It softens and rejuvenates the skin. Nevertheless, for the buck you’re paying, not only you get a natural Vitamin C serum, but also a serum that brightens and softens your skin, making it look young and radiant once again. 3.Smoothing out the skin and evening your skin tone, the OZNaturals- Vitamin C Serum leaves your skin nice and glowing. It fights free radicals and sustains the collagen in skin, reducing the appearance of wrinkles and fine lines. The serums are made with Vitamin C and vegan hyaluronic acid, slowing down the aging of skin. The free radicals are the main cause of aging of skin, which translates into wrinkles, age spots and uneven texture and tone. Not only the serum is stopping the free radicals from damaging your skin, but it also repairs the current damage of skin. The vitamin C of the serum is fundamental in to collagen production, whereas the astaxanthin is highly effective antioxidant. The Vitamin E strengthens the skin’s natural barrier and minimizes the risk for dehydration and damage. We also have to pinpoint that the serum doesn’t include parabens, phthalates, petrochemicals, sulfates nor other potentially harmful synthetic chemicals. It doesn’t contain alcohol and doesn’t clog pores. You may apply the serum both in the morning and at night. Stay safe in only use it once a day any now and then in the beginning, to give your skin time to adjust to it. Use a moisturizer afterwards and wait for a month until obvious results. The serum is safe to use on all skin types, dry and irritated skin including. It’s a reliable choice in case of eczema, acne and other various skin conditions. Despite the inherent flaws, the serum brings a lot of good things to the table and it’s a good investment to make for better and younger looking skin. 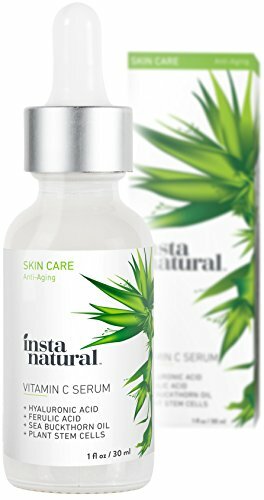 4.Made in our USA, the InstaNatural Vitamin C Serum with Hyaluronic Acid & Vit E is an anti-wrinkle serum that reduces blemishes on skin and various signs of aging like fine lines, sun spots, wrinkles and hyperpigmentation. You may use the serum as a spot treatment as it’s formulated on advanced ingredients that strengthen skin and stop the damage of skin too. The vitamin C gives your skin the antioxidants it needs for protecting against the aging effects of outer stressors like the bad UVs and pollution. The formula includes also Vitamin E, argan oil, organic rosehip and sea buckthorn oil. On the list of ingredients, you’re going to find various ingredients that are already known for their benefits on skin: camellia sinensis leaf extract, ginkgo biloba, punica granatum extract, licorice root extract, witch hazel, grapefruit peel oil, carrot seed oil, apricot kernel oil, dandelion extract and so many more. Able to remove the first signs of aging, the serum is also powerful enough to lower the risk for forming them in the next future. The serum glides on smooth and right into your skin. It doesn’t irritate the skin and it’s 100% safe and effective. A little goes a long way and the serum has a rather nice and subtle smell. You should massage only a small amount onto your cleansed and toned skin, letting it dry entirely. It’s better to use a moisturizer afterwards. The formula of the serum is well thought out and safe for all skin types, oily skin including. Strong enough to make age spots, sun spots, discoloration less visible but also to eliminate dryness, splotchy and patchy skin, the serum stands out with a complex formula and a good price too. Packed with numerous ingredients that benefit all skin types, the serum is a winner for many, no matter the size of the pocket. 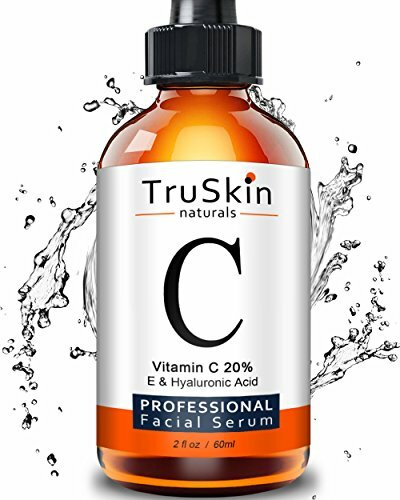 5.One of the most popular choices out there, TruSkin Naturals Vitamin C Serum for Face, Topical Facial Serum with Hyaluronic Acid & Vitamin E impresses with its high efficiency on so many levels. The list of ingredients is long and the serum includes several ingredients that are well known for the benefits they bring to the skin. The formula of the serum is well thought out which is why the serum makes the sun spots, irritations and blemishes less visible. It also treats eczema and psoriasis and firms the skin, leaving a healthy radiance to it. The serum is made with Vitamin C, vitamin E, jojoba oil and Hyaluronic Acid. The list of ingredients also includes aloe Vera that fights against aging of skin, diminishing the appearance of acne scars and stretch marks. Each of the ingredients plays it parts when improving your skin complexion, leading to the ability of the serum to minimize the wrinkles and fine lines, keeping your skin healthier and younger looking. On top of everything else, the formula is plant based and doesn’t contain any stabilizers, fragrances nor synthetic color additives. It has never been tested on animals and it’s formulated and bottled in our USA. You should run a patch test and leave it for 24 hours to see if there are any side reactions. 3-5 drops will do for each use and you can use it twice a day for best results. As the serum is pretty powerful, you should follow it with a moisturizer. Easy to absorb into the skin, the serum is rather lightweight and may serve you well for more than 3 months. All in all, as it’s plant based and reliable for improving your skin complexion, the serum is a great investment to make for your skin anytime. 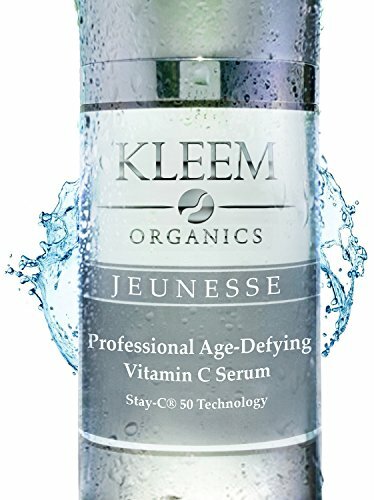 6.Kleem Organics gives us an effective anti-aging treatment with the NEW Improved Vitamin C Serum for Face, that addresses both women and men. The serum increases firmness in skin and leaves it smoother and toned, rejuvenating it at the same time. The serum isn’t just a lightening cream, but also a reliable age spot and dark spot remover for your skin. It’s lightweight and easily absorbed in skin, leaving a fresh and silky feel to it. The list of ingredients isn’t short for use and here’s what you’re going to find on it: vitamin C, hyaluronic acid, Vitamin E, witch hazel, ferulic acid, organic jojoba oil, organic Gotu Kola extract, rose ether, geranium extract, horsetail plant extract, aloe Vera and dandelion extract. If most of the names don’t tell you much, know this: each of the mentioned ingredients is well-known for the ability to improve the skin complexion and keeping it healthier and younger looking for longer time. Easy to use, the serum glides on easy on skin and smooths it out. A little goes a long way and the serum works for all skin types, including skin with dry patches or irritated. The serum shrinks the pores and improves the skin’s texture. It hydrates the skin and evens out the skin tone, with no greasy residue leaving behind. Made in USA, the serum doesn’t contain parabens or alcohol and has never been tested on animals either. No matter the inherent flaws, for the numerous benefits on skin, the serum is a definite “yes” next time you’re in need. 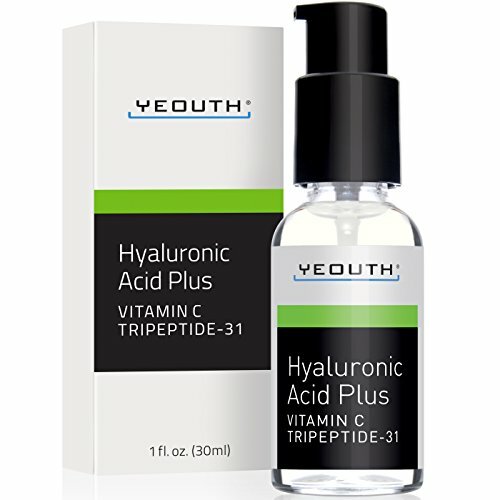 7.Even though the YEOUTH Best Anti-Aging Vitamin C Serum with Hyaluronic Acid & Tripeptide isn’t the best Vitamin C serum, it still manages to be a sure thing for many. Cruelty free and vegan, the serum isn’t just an anti-wrinkle treatment, but also a dependable moisturizer for the skin. The formula is safe to use on all skin types, even on the sensitive area around the eyes. The serum doesn’t cause any irritation or redness and leaves no greasy feel behind. It’s easy to use, AM and PM, on face, neck and décolleté. Needless to say, the skin has to be cleansed and dry. Some even apply the facial toner prior the application of the serum. For best results, don’t forget to moisturize the skin after the serum. A fast spotlight on the ingredients helps us better understand the power of the serum. The Vitamin C reduces the wrinkles and fine line, but the Yeouth HA includes an impressive concentration of Vitamin C.
The naturally occurring hyaluronic acid seals in the moisture of skin so the serum hydrates and plumps the skin, improving the moisture retention. As for the Tripeptide 31, it’s important to know that is minimizes the collagen breakdown, restoring the hyaluronic acid levels. It boosts the efficiency of the serum overall. It fills in the fine lines, repairs the dark circles and improves the skin’s texture and tone. The serum tightens skin and you only need to apply a very thin layer each time. This is why the serum is going to serve you for a good amount of time. Fading out discoloration and minimizing the pore size, the serum fights against skin aging and makes the wrinkles less noticeable. It goes without saying that for a good price you get a dependable anti-aging serum that maintains the skin healthier and younger for longer time. 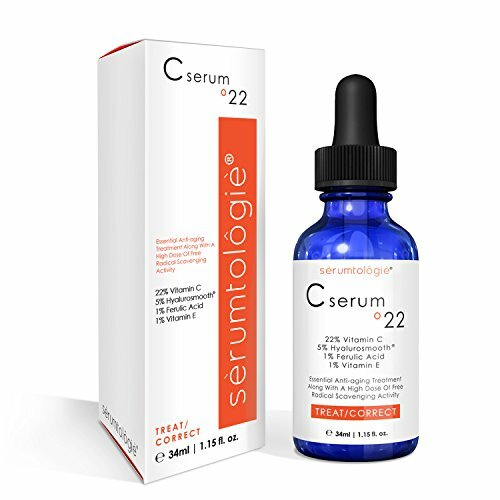 8.100% vegan and never tested on animals, the Vitamin C serum 22 by serumtologie Anti-Aging by Serumtologie doesn’t stands out from the crowd with just that, but also with its 22% Vitamin C concentration. 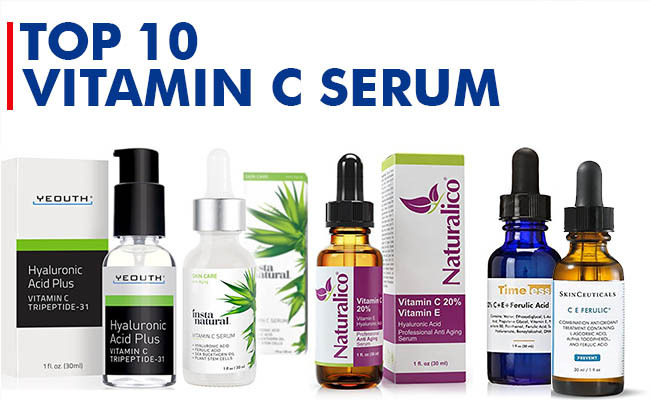 The serum presents this impressive concentration of vitamin C which explains its anti-aging abilities. Made with natural and organic ingredients, the serum is both effective and gentle on skin, with no risk for causing irritation. This is why the serum is also safe to use on all skin types, acne prone, sensitive and aging skin including. It hydrates the skin and leaves it softer and brighter as it lessens the visibility of fine lines and wrinkles. It protects the skin from damage of sun and sustains the collagen in skin. The main ingredients within the formula are Vitamin C, hyaluronic acid, ferulic acid and Vitamin E so the serum rejuvenates the skin and gives it a healthy radiance too. Additionally, the list of ingredients also includes Gotu Kola, horsetail, dandelion, wild geranium, witch hazel, aloe Vera, jojoba oil and dandelion. In order to get dramatic changes, it’s better to use the serum both AM and PM. The serum soaks right into the skin and dries fast too. It goes under makeup as it doesn’t flake and has no scent, so you may easily combine it with other skin care products. Don’t worry about its color that may vary from clear to milky white. It’s because the formula is based on natural botanicals. It also doesn’t include parabens, phthalates, sulfates, petrochemicals, synthetic dyes, aromas or GMO’s. The serum leaves the skin smoother and clearer, minimizing the fine lines and improving the overall skin complexion. For what it’s worth, the serum is both effective and gentle and comes for a very good price too. View the full review. 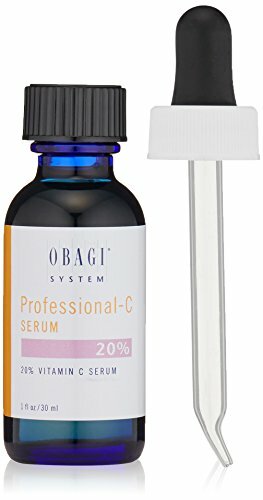 9.Highly concentrated and efficient, the Obagi Professional-C Serum isn’t at all the choice of a tight budget, but it’s sure the right option for anyone interested in high quality Vitamin C serums. The serum isn’t the typical Vitamin C serum as it’s concentrated with antioxidant L-ascorbic acid and works great for normal to oily skin. Its one-of-a-kind formula is strong enough to lessen the visibility of skin aging, leaving the skin healthy and radiant. Penetrating nice and easy the skin, the serum makes the fine lines and wrinkles less visible, but also calms your skin. It brightens the skin complexion and improves the overall appearance of skin. Able to retain skin’s natural moisture, the serum stabilizes vitamin E and slows down the aging process of skin. You only need to use 5-7 drops of each use and gently tap it with your finger tips on face, neck and chest. It comes with a dropper so application shouldn’t be difficult. Don’t forget to follow it with your sunscreen and moisturizer. Don’t worry if the serum gives a tingling sensation in the beginning. It’s going to disappear once your skin gets used to it. In order to maintain its property, keep in mind to store the serum in dark and cool place, away from direct sunlight. Even though one may feel like paying an arm and a leg for it, the serum lessens the appearance of aging signs and brightens your skin tone. View the full review. 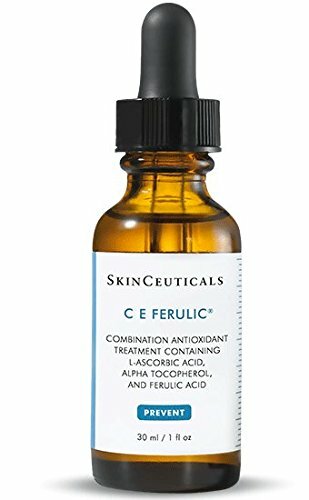 10.When you make no compromise anything for the health and youth of your skin, you should put your money at stake with the Skinceuticals C E Ferulic 1 Fluid Ounce. The serum is a true winner for the appearance of your skin as it makes such a difference on so many levels. It protects the skin from the outer aggressors as it’s strong enough to minimize the damage of free radicals. Able to reduce the visibility of wrinkles and fine lines, the serum firms your skin and brightens the skin complexion. It diminishes the damage of free radicals to the upper layer of the skin, minimizing the impact of ozone damage to skin at the same time. The serum is based on Vitamin C and stays efficient for at least 72 hours. It’s easily absorbed into the skin and addresses normal, dry and even sensitive skin. The formula includes also Vitamin E and 0.5% ferulic acid, which explains its power over the free radicals. The serum slows down the aging of skin and doesn’t have just antioxidant protective abilities, but also minimizes photodamage. It lessens the visibility of wrinkles and fine lines and fights against loss of firmness, brightening your skin tone. You should apply it in the morning, once your skin is cleansed and tones. 4-5 drops are going to be enough for face, neck and chest. Apply it before any other anti-aging skin care products. Tightening the skin, the serum doesn’t wash off and it’s a wise investment to make for your skin. All things considered, as it’s effective and dependable, the serum isn’t the choice of the tight budget, but sure is the option for anyone willing to pay the extra buck for a healthier and younger looking skin. 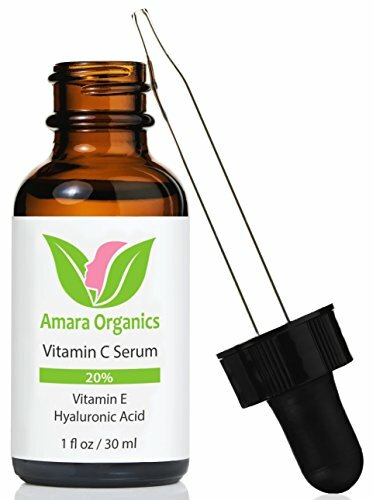 Softening the fine lines and making the age spots and freckles less visible, the Amara Organics Vitamin C Serum for Face 20% with Hyaluronic Acid & Vitamin E is a valid option when trying to improve the appearance of your face. The serum evens your skin tone and gives your face a nice glow, clearing it from breakouts and minimizing acne scars. It also prevents from reoccurrence of this kind of skin issues. It shrinks pores and leaves the skin soft and smooth. The formula is complex and includes 20% Vitamin C, hyaluronic acid and Vitamin E, which reverse the aging signs of skin in a gentle way. Additionally, the formula also includes Jojoba oil, aloe Vera, witch hazel, Gotu Kola, horsetail plant extract, dandelion and geranium extract. As if the natural ingredients weren’t enough for the serum’s efficiency, the formula also doesn’t contain any parabens, fragrances or dyes. The natural and organic ingredients are great and the serum is cruelty free and made in our USA. The serum is non-irritating and works for all skin types. Even though it’s powerful, you may safely use it AM and PM, on a cleansed and dry skin. You can follow it with your typical moisturizer. It goes great right under your makeup too. Brightening your skin tone and improving the appearance of skin, the serum feels good on skin and gives results. Regardless of the downsides, we think the serum still is a great option for improving your face and you shouldn’t skip it on when shopping. See the full review. When you’re getting a travel set like the ArtNaturals Organic Vitamin-C and Retinol Serum, you just know you’re in for an amazing treat. The Vitamin C serum is going to work against the aging of skin, whereas the Retinol serum is both antioxidant and able to boost the collagen production in skin. Even though one may find it a bit more time-consuming using the both serums together (it all depends on how great and young you want your skin to look), it’s going to worth to spend the extra minute in the morning and at night. The Vitamin C serum is going to make the fine lines and wrinkles less noticeable, but it’s also going to fade out dark circles and spots. It smooths out hyperpigmentation and fights free radicals. 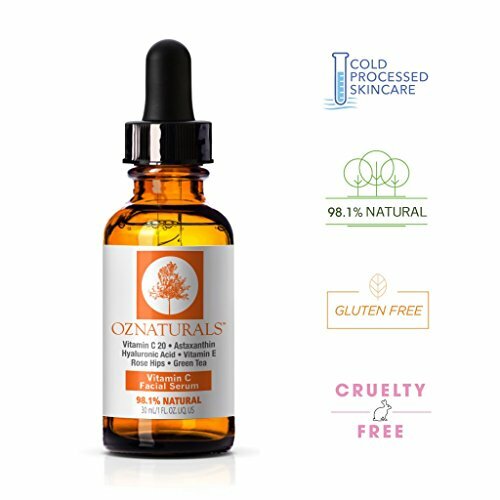 Gentle and organic, the Vitamin C serum isn’t just formulated with Vitamin C, but also with witch hazel, botanical hyaluronic acid, jojoba and Gotu Kola oils, organic Aloe extract, dandelion and wild geranium extracts, and horsetail. The same thing goes for the retinol serum that not only contains the previously mentioned ingredients, but also wheat germ oil, Vitamin E, organic Green Tea extract, and propolis extract. If the Retinol serum is antioxidant and fights against bags, spots and crow’s feet, the Vitamin C serum slows down the aging of skin and brightens the skin tone. Both serums are made with natural ingredients and are paraben and cruelty-free. The serums leave a nice a refreshing feel on skin and dry out pretty fast. 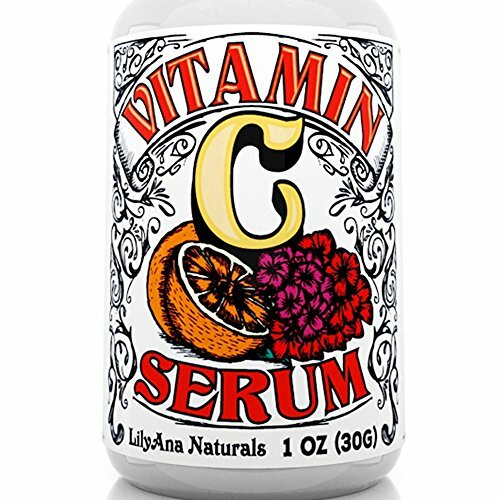 The vitamin C serum doesn’t flake and combines pretty well with various cosmetic products. Due to their formula, the serums work for combination and acne-prone skin. They shrink pores and even out the skin tone. As for the smell, it’s rather subtle for both and doesn’t stay for long on skin either. Making a great and efficient “team” that works for the benefits of your skin, you shouldn’t hesitate about the set and get it next time you’re in need. 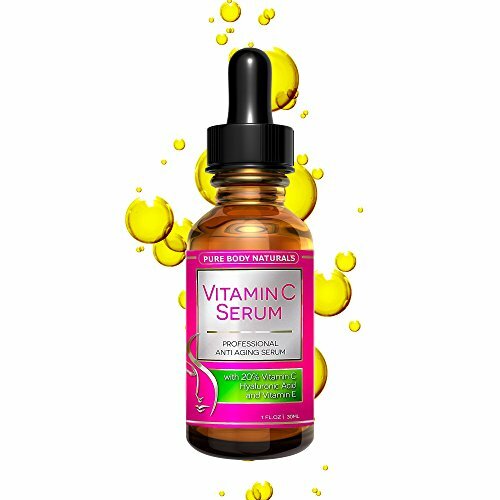 Due to its formula, the Vitamin C Serum with Hyaluronic Acid for Face and Eyes by Lily Ana Naturals is able not only to control the oil production in skin, but also to slow down the aging of skin. The serum is a great choice for the acne prone skin and works for the sensitive skin too. It brightens and evens the skin tone, while sustaining the collagen in skin. It clears your skin and improves the texture and overall appearance of your skin. The potency of the serum comes from the combination of the ingredients. For example, the vitamin E smooths out hyperpigmentation and scars, while making the fine lines and wrinkles less visible. You may use it around and under eye area when you’re trying to diminish dark circles and wrinkles. Both women and men may benefit from the serum which isn’t just strong, but also non-comedogenic. Twice a day use is going to give results after a while, but keep in mind that skin reacts differently so one may have to wait a bit longer until obvious improvements. The serum doesn’t leave any oily residue behind and goes right into the skin. It absorbs fast with no sticky or greasy feel afterwards and your makeup is going to glide on really smooth. A little goes a long way and you can apply the serum on face, neck and decollate. It’s better to follow it with your moisturizer. On the list of ingredients, you’re also going to notice botanical hyaluronic acid, organic aloe leaf juice, organic Gotu Kola extract, horsetail extract, but also wild geranium extract and organic dandelion extract. You’re not going to notice any parabens, artificial color or fragrance within the formula, which is always a good news. Made in our USA, the serum also works for the African-American skin and gives a natural look to any skin. Its bottle is opaque so it’s going to hold up pretty well. Loaded with natural ingredients and able to address so many skin issues, the serum still stands as a reliable option even for the pickiest customer. 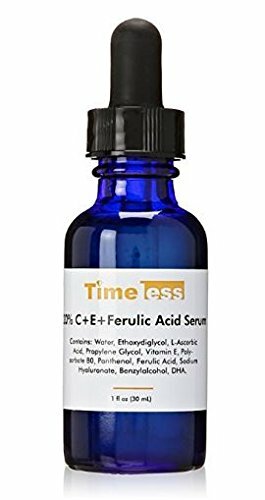 Trying to repair some acne scars may be both time and money-consuming and you can have a sure shot with the Timeless Skin Care 20% Vitamin C Plus E Ferulic Acid Serum by Timeless Skin Care. Not only the serum is based on Vitamin C, but it also contains high concentrations of hyaluronic acid and matrixyl. The powerful formula makes the serum able to diminish the visibility of dark spots, acne scars, and also the smooth out the fine lines and wrinkles for a younger and healthier look of your skin. Additionally, the serum is all natural and paraben free with fewer chemicals. This doesn’t just mean that the serum manages to be efficient in a delicate way, but also that you have to store it in the refrigerator so that it maintains its properties. 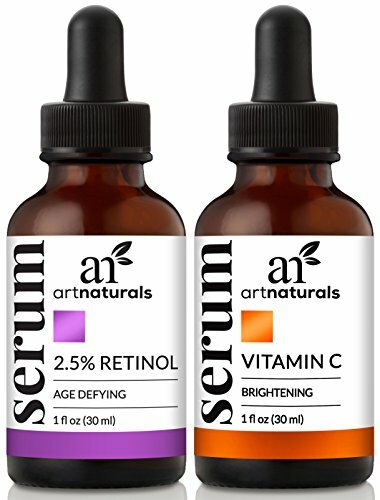 The Vitamin C within the formula is a strong antioxidant that evens the skin tone and sustains collagen in skin, whereas the Vitamin E and ferulic acid extend the lifespan and increase the power of vitamin C. The serum also contains hyaluronic acid that hydrates and moisturizes the skin for long time. The serum evens out your skin tone and smooths out the skin, softening the fine lines and fading out the acne scars. It may lead to some irritation and exfoliation and it’s not the best choice for the sensitive skin either. Soaking in nice and easy into your skin, the serum is easy to apply. Let it dry before applying your regular moisturizer for a proper skin care routine. Made in our USA and parabens free, the serum may be used twice a day. Pay attention to your skin and adjust the usage accordingly. It dries easy and doesn’t leave a residue. Regardless of the minor issues, as it’s efficient for smoothing out the acne scars and so much more, the serum is one option to include in your skin care routine. 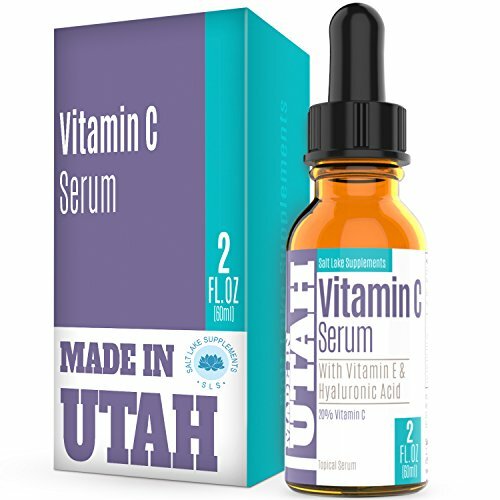 Some of the Vitamin C serums out there may give some irritation to the sensitive skin, but that’s not the case for the Vitamin C Serum Face and Skin Rejuvenation with Hyaluronic Acid by Salt Lake Supplements. The explanation for this is the formula of the serum that manages to be effective, but in a gentle way. The serum helps the production of collagen and makes your skin look younger and more radiant once again. The hyaluronic acid within the formula seals in your skin’s moisture and tightens your skin, for a firmer feel and appearance. We also notice the vitamin E within the formula that keeps the free radicals away from damaging your skin. It also protects the skin from aging, maintain its youth feel. Here’s what you’re also going to find on the list of ingredients: organic Aloe leaf, witch hazel, jojoba oil, Gotu Kola extract, geranium extract, dandelion extract, and horsetail plant extract. The serum is easy to use and absorbs fast into the skin. You should let it dry a bit before applying your typical moisturizer. Giving suppleness to your skin, the serum smooths out skin and makes the fine lines and wrinkles slowly fading away. It’s not greasy and doesn’t cause breakouts, managing to be a great choice to use right under makeup too. Nevertheless, as it makes your skin suppler and younger looking, the serum still is a great value for the price. 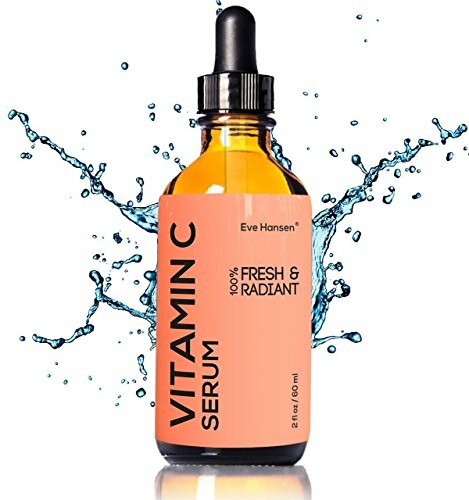 The market gives you a great variety of options when it comes to organic Vitamin C serums and one of the most popular options is for sure the Eve Hansen Vitamin C Serum. Powerful enough to address wrinkle treatment and to shrink pores, the serum also rejuvenates skin, increasing its ability to defense against the outer stressors. The serum is an anti-wrinkle option that fades out fine lines, wrinkles, sun spots and dark spots, repairing the skin in a natural wat. The liquid Vitamin C serum clears the skin and improves its texture, boosting the collagen production in skin. It makes the wrinkles more difficult to notice and brightens the skin complexion. Here are some of the ingredients within the formula: Vitamin C, botanical hyaluronic acid, organic aloe, vitamin E, organic Gotu Kola, organic jojoba oil, organic dandelion, wild geranium and even horsetail. The serum is easy to use and only 3-5 drops are enough for each use. Pat it gently and massage it onto your face, neck and everywhere else you need. It’s better to run a patch test if your skin is sensitive. In order to help your skin, adjust to the serum, you should only use it every 2-3 days for a couple of weeks before you use it constantly. Never apply it on irritated or damaged skin. Softening the skin, the serum diminishes the visibility of crow’s feet around the eyes and firms the skin. It doesn’t leave a residue and doesn’t go on clothes. Some use it right under makeup. It’s not impossible not to notice dramatic changes as skin reacts differently. As long as you’re focusing on the good things, which are plenty, you’re not buying a lemon when getting the organic Vitamin C serum by Eve Hansen.